False Flag in Arrondissement 11. The Big Lie World Tour Revisits the French Capital. The curiously bloodless police murder. We are told a tragedy has taken place at the offices of Charlie Hebdo (Weekly Charlie) magazine at No 10 rue Nicolas Appert, in the Arrondissement 11 of North Eastern Paris on January 7th, 2015. We are told that at around 11.30 am masked gunmen entered the building housing the offices of the magazine and proceeded to murder 12 people with firearms, including at least 4 employees of Charlie Habdo and two Police Officers. We are told that video footage shows the wanton murder of a wounded police officer. We are told that the gunmen, were driven by a third individual, Hamyd Mourad, a younger man who inexplicably fled the getaway car during the crime. It has now emerged that Hamyd Mourad. 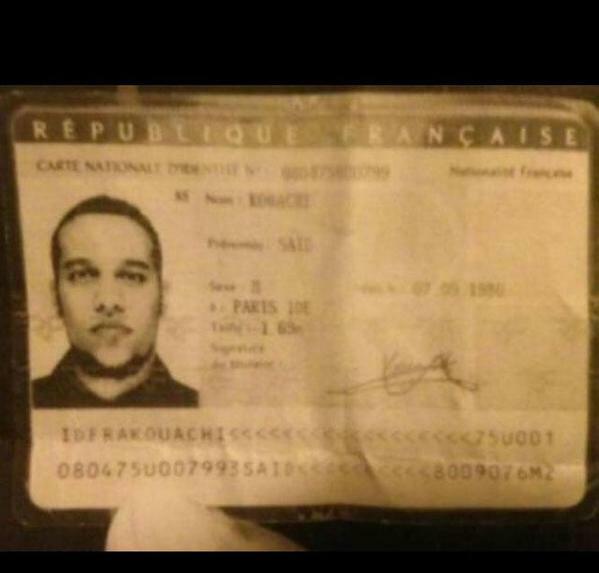 has turned himself in to the French police and has been able to provide a corroborated alibi for the time of the attacks. He was attending school, and how his name came to be associated with this event is a complete mystery. We are told the gunmen were masked, spoke perfect French and according to eyewitnesses, wanted it to be known that they acted in the name of al Qaeda in Yemen, formally known as al Qaeda in the Arabian Peninsula. We are told that the gunmen were armed with a pump action shotgun, Kalashnikov AK 47 Assault Rifle and a Rocket Propelled grenade Launcher. The fleeing gunmen are not carrying an RPG launcher and there are no reports of any RPG being fired so the fate of the supposed RPG is rather puzzling. It stands out that there seems to have been a rather ostentatious attempt to use weapons closely associated with Arab and Muslim insurgents. The Patsies have Been Identified. The combination of AK’s and RPG’s, masks, telling people to blame al Qaeda, ridiculously shouting that the prophet has been avenged adds up to this. If this attack even took place, it was not conducted by Arabs or Muslims, but their enemies. And they made it pretty obvious. One pertinent fact that will never ever be mentioned in relation to this case is the recent French vote at the UN Security Council on a resolution that set a deadline for the end of the Israeli Occupation of Palestine and set to place a time limit on the demand of the end of 2017. This attack was in all likelihood, whether false flag or hoax, an attempt to renew the narrative of the War on Terrorism and reinstate Israel and the West’s phony status as being the “victims of terrorism”. The al Qaeda in Yemen group (formally known as al Qaeda in the Arabian peninsula) have played a role in the theatrical side of the War on terror but they have not actually killed anyone outside of Yemen. Ever, and there is little to no evidence of them planning to do so. The al Qaeda Yemen group has never come close to conducting any attacks against a western target, the group were blamed for the “underwear bomber” plot of late 2009 and have been attacked by US drones and other aircraft for several years, including one strike that targeted a sixteen year old US citizen. The underwear bomb plot was a ruse conducted by Western intelligence in order to maintain the fiction of an external terror threat. The bomber had neither a passport nor a ticket for the flight he essentially tried to attack with a bomb that was all detonator and no device. 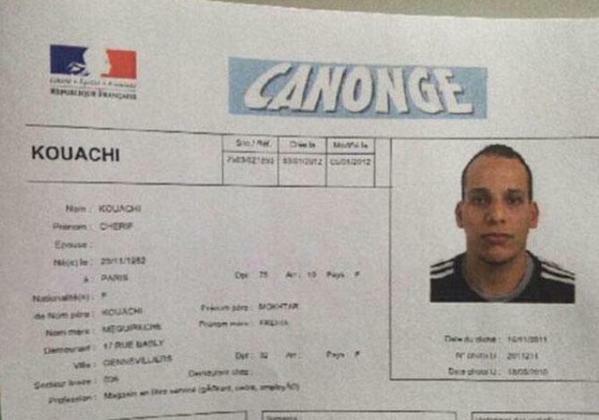 The supposed bomber was ushered onto the flight by representatives of Western Intelligence, there was no bomb per se. The bomber appears to have been a mindless zombie going through the motions of being a terrorist as per his handler’s orders. The bomber has been revealed as a CIA Agent and these articles deal with the case comprehensively. Northerntruthseeker: Exposing The Fraudulent Detroit “Underwear” Bombing: Terrorism 101: Governments ARE The Terrorists! » BREAKING: Kurt Haskell Exposes Government False Flag Operation During Underwear Bomber Sentencing Alex Jones’ Infowars: There’s a war on for your mind! Quite why a couple of French of Algerian origin would choose to align themselves with al Qaeda in Yemen rather than the North African al Qaeda branch al Qaeda in the Magreb is unclear. It also seems odd that al Qaeda in Yemen would be motivated to attack a civilian target in France given that France has not lifted a finger against them whereas there are several thousand French troops currently in Northern Africa “fighting jihadists” in Mali and surrounding states. History’s Lessons are there for those with Eyes. Each investigation should be undertaken with an open mind. The War on Terror thus far has been a crude and cruel hoax and fraud built entirely around false flag terrorism and manufactured events. It would be a completely unprecedented if an authentic terrorist attack actually happened in the West and that is the context in which these events are happening. The fact that a large proportion of the intended audience lap up these lies like mother’s milk is understandable, albeit regrettable. The Western public have been raised quite simply in a world of lies, it’s all they know. they also deserve contempt, the same contempt that a 14 year old who believes in Santa Claus and the Easter Bunny deserves. These people deserve pity, alongside contempt. The Western Media-a Long Term and Proven Record of Brazen and Despicable Lies. The behaviour of the Western media during these synthetic events is completely predictable. Each and every time we are unquestioningly presented with a fait a compli Once an event begins the entire media begin to act as the curators of the psy-op, all delivering each and every lie on cue. It would be virtually unprecedented precedented to find an authentic act of terrorism conducted in the West during the despicable War on terror. The fact that a large proportion of the Western populace believe in the authenticity of this narrative does not make it so and only indicate that these “true believers” are so gullible as to be incapable of critical thought. 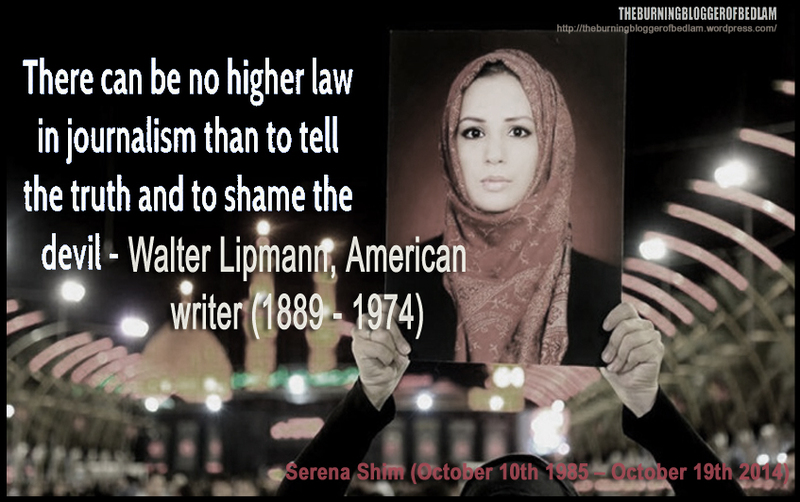 Indeed to even describe the Western media as a”media” is a serious misnomer. The Western media are, when it comes to terrorism, nothing more than venal worthless whores in service of organised crime and tyranny. In a just world, they would be tried for Crimes against Humanity and face the most serious legal sanctions available to punish the propagandists of genocide. Justice would see them either imprisoned for life or executed. This is who they are and that is what they deserve. They aren’t going to get it, at least not in the short term, and I am not suggesting that anyone has the right to harm them or act outside the law. but make no mistake, they are War criminals of the most heinous and despicable type. Their crimes will never be forgotten. Nothing they can do will ever atone for the evil they have enabled. The Real Question-False Flag Terror or Manufactured Hoax? The only real question when looking at these supposed terror attacks is whether they were false flag terror managed and concocted by Western Intelligence agencies, or a complete psy-op and total fabrication. I find it hard to believe that such a public event involving the deaths of so many prominent and well known people could be a complete fabrication, time will tell what specific variety of lie is being foisted upon the world on this occasion. 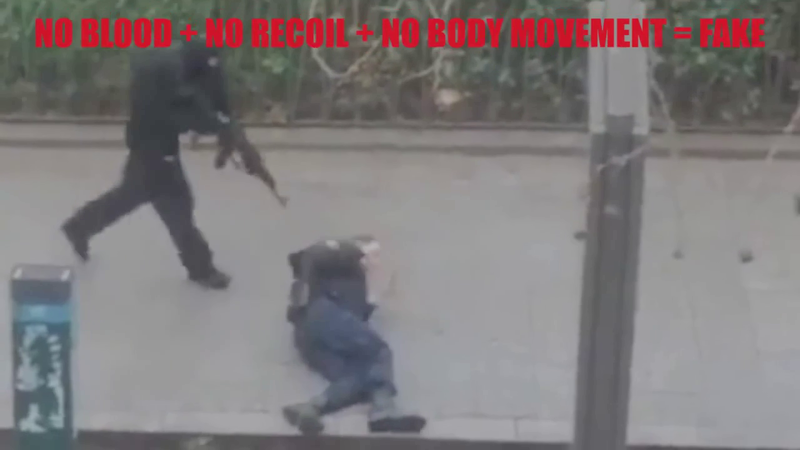 The dramatic execution of a French policeman by a masked gunman tends to indicate that this may be simply another in the long succession of security drills sold as a live event. Building on the tradition of outright fraud and fabrication established with the Boston bombings and Woolwich fake beheading in 2013, and the Ottawa and Sydney siege fiascos of 2014.Time will tell us which genre of lie this event belongs,either way,it is a lie.